Nature always inspires me so I'm happy when I can create something using nature itself! And when it comes to stones.... I have plenty in my back yard......too many, in fact. So if you want some, come on over! These hand drawn designs were made with a sharpie and were inspired by these owl pebbles. I love them all, but I think the butterflies are my favorites. 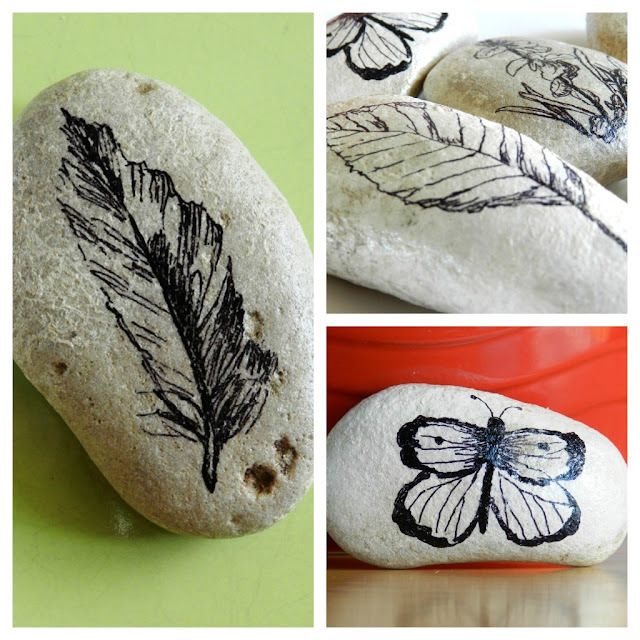 I have plans for many more decorative stones.... birds, bugs, and even sea creatures! I can't wait to get crackin'! They're beautiful, Elise. The feather's my favorite! I really love the stones!They are fantastic! Wow - those are pretty. I wish I could draw. You're so talented! These are simple, but so pretty. I'd say, think of a way to use a group of them together, maybe some decorated, some plain. Then sell them! The stones are so pretty! You did a great job! Your drawings are so beautiful! Love the butterflies. Your stones are so pretty! I don't think my drawing talent is good enough for them to look anything like yours, but these are really cool! I LOVE your stones and your designs are lovely. Thanks for the inspiration. Sweet and simple as I like ideas! Since I remember me I collect stones, I love every one! These are adorable!I love butterflies but I can't choose which I more like, they are both lovely. I found you in Carolyn's Homework . Thanks so much for linking up to Creative Thursday. Can’t wait to see what you share next week. Have a great weekend. These look so beautiful! Hope you don't mind if I pinned them. These are beautiful. Did you have to use sealant so they didn't rub off? Thank you! I did put a light coat of modge podge on these. I don't know if sharpie would rub off, but I like how the modge podge gives them a little shine.